Vladimir Fedoseyev, artistic director and chief conductor of the Tchaikovsky Symphony Orchestra and permanent guest conductor of Opernhaus Zurich and Zurich Tonhalle, is world-famous for his interpretations of most unlike composers from various epochs and styles. Along with Mozart, Brahms or Shostakovich, his repertoire also includes less known masters like Janacek or Berg. Over his long career, Vladimir Fedoseyev has won numerous international awards: Russia's order "For Services to the Motherland" and Austria's Silver Cross for his services to culture (both 1996); the Gold Star from the City of Vienna (2002); the Cross of Honour for Science and Art, First Class, from the Austrian Academy (2005); the most recent Gold Medal of the International Gustav Mahler society (2007); and others. Vladimir Fedoseyev graduated from Moscow's Gnesins Musical Academy and Tchaikovsky Conservatory (class of Professor Leo Ginzburg) and was invited by the legendary Evgeny Mravinsky to conduct the Leningrad Philharmonic Orchestra. He made his opera debut also in Leningrad (now St.Petersburg), his native town, in the Mariinsky Theatre. In 1974 Vladimir Fedoseyev became artistic director and chief conductor of the Moscow Radio Symphony Orchestra, now known as the Tchaikovsky Symphony Orchestra. 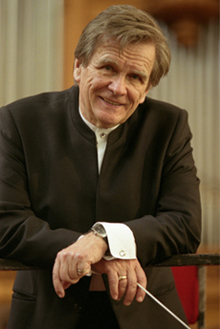 In addition, from 1997 to 2004 he was a chief conductor of the Vienna Symphony Orchestra. In recent years Maestro has worked as a guest conductor with many of the world’s leading orchestras such as the Bayerischer Rundfunk, Köln Philharmonic, Leipzig Gewandhaus, Berlin Philharmonic, Zurich Tonhalle (where he conducts every season) and Orchestre Philharmonique de Radio France. He is also highly esteemed in Japan, where he was appointed a principal guest conductor of the Tokyo Philharmonic Orchestra in 1996. In the 2004/05 season he worked as a guest conductor with the Cleveland Orchestra and the Detroit and Pittsburgh Symphony Orchestras. Beginning from January 2009 artistic director and chief conductor of the Tchaikovsky Symphony Orchestra - Vladimir Fedoseyev is invited to be a principal conductor of The Orchestra Sinfonica di Milano Giuseppe Verdi. Critics have always noted Fedoseyev's striking distinction, uniqueness of his programs, finds of new compositional pieces and original interpretations of well-known musical scores. Among his major successes there were opera stagings of Mussorgsky, Tchaikovsky, Verdi, Berlioz, Janacek and Shostakovich in Vienna, Paris, Milan, Zurich, Bregenz, Florence and elsewhere. He also has a wide range of recordings which encompasses symphonies, operas and ballets of Rimsky-Korsakov, Rakhmaninov, Stravinsky, Scriabin, Brahms, Beethoven and more. In early 2008 he completed a full collection of Brahms' symphonies issued by Warner Classical & Jazz and Lontano. The 2007/08 season was started in Cannes with “War and Peace” at the 10th festival of the Russian art, followed by the concert in the Red Square “Masterpieces of the violin art” with A. Baeva, H. Hann, J. Bell, P. Zuckerman, the concert “Her Majesty Music” with participation of M. Volle, K. Stoyanova, M. Giordano, V. Repin in memory of Luciano Pavarrotti and a big UK tour (Bristol, London, Croydon, Cambridge, Leeds, Birmingham) with Tchaikovsky Symphony Orchestra. In the spring the Zurich audience saw a new staging of “Boris Godunov”. Among the future significant performances, the 2008/09 season will include a program of Tchaikovsky’s symphonies (including his opera “Iolanta” in Tokyo and Osaka) and a number of concerts with the Bayerischer Rundfunk orchestra, Wiener Symphoniker orchestra, Orchestra Sinfonica di Milano Giuseppe Verdi and Finish Radio Symphony orchestra, as well as tours with the Tchaikovsky Symphony Orchestra to Europe, South America, Japan.